Clearly, the woman is on a mission to break the Internet again. Lightning may not strike the same place twice, but Kim Kardashian can attempt to break the Internet again as many times as she pleases. "Kardashian is currently in Miami to support hubby Kanye West, who's bringing his 'Saint Pablo' tour to the American Airlines Arena this weekend," reports E! Online. As it turns out, Kim decided to get herself a spray tan sometime around midnight on Thursday, September 15. Us magazine notes: "The Selfish author, 35, shared the naked selfies from her Miami hotel room, using just her arms and a strategically placed chair to cover her breasts and nether regions." 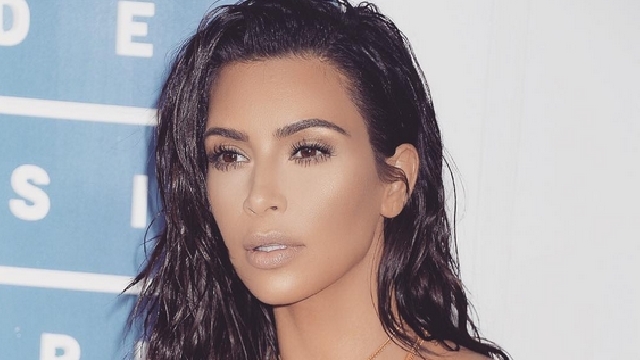 Oh, in case you're interested, there's a video to accompany Kim's latest naked selfies. In it she says, "Nothing like a midnight spray tan, you guys. Tanorexic." We're all for being body positive, but we're not sure if the use of a word that recalls an eating disorder is cool.